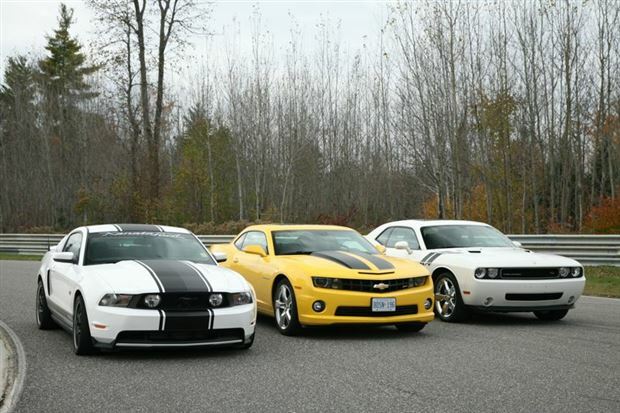 Calabogie, Ontario — Camaro SS vs Challenger R/T vs Mustang GT: most readers know that all the big U.S. publications have done it, as have all the TV shows, magazines and web sites. They all have their winner and their loser and they all have different reasons for their choices. So why bother doing something just to be another “me too”? Let’s be honest here: given the opportunity of a few hours on a racetrack with free reign of three of the most influential cars in the history of the American automobile, who the heck WOULDN’T want to do this test? This challenge fell into place rather quickly: Paul Williams, Senior Editor at Autos, sent me an e-mail mentioning that he and Managing Editor, Grant Yoxon were in possession of a Camaro SS and a Challenger R/T for a series they were doing called Made in Canada. One problem though – the lack of a Mustang! Fortunately, it just so happens the President of Kanata Ford (near Ottawa) not only sells cars but also loves everything about them. It didn’t take much convincing for him to make a 2010 Ford Mustang GT with Track Pack available for the test. Heck, he pretty much volunteered the car before the request was even made! The location was the key: to do this comparison, a venue was required that would allow these cars to really push the limits of handling and braking. Ottawa is lucky that it has a world-class racetrack facility only an hour away, known as Calabogie Motorsports Park (CMP). The track’s owners not only agreed to the use of their incredible track, but were extremely accommodating and friendly. Designed by world-renowned race track designer Alan Wilson, this 5.05-km road course features 20 turns, two long straights, 65 feet of elevation change and beautiful scenery — not that you really have time to look while driving! In no particular order, the three competitors for this challenge are: the 2010 Chevrolet Camaro SS, weighing in at 1,746 kg (3,849 lbs), producing 426 hp and 420 lb.-ft of torque with a power-to-weight ratio of 9 lb/hp and a price-tag of $44,865. The Dodge Challenger R/T weighs in at 1,832 kg (4,041 lbs), has 376 hp and 410 lb.-ft of torque with a power-to-weight ratio of 10.7 lb/hp and a price tag of $43,470; and the Ford Mustang GT with factory Track Pack, which weighs 1,602 kg (3,533 lbs), produces 315 hp and 325 lb.-ft of torque with a power-to-weight ratio of 11.2 lb/hp and a price tag of $43,349. James Bergeron is an Ottawa-based automotive journalist. James holds a national FIA race license and actively races and stewards at race events.